Used topically for WRINKLES, SCARS, STRETCH MARKS, RASHES, BURNS, ACNE SCARS, DRY SKIN, CRACKED SKIN, ECZEMA, PSORIASIS, CELLULITE, ACNE AND OTHER SKIN CONDITIONS... PURE EMU OIL is highly recommended for DRY, CHAPPED LIPS, and ANTI CELLULITE. 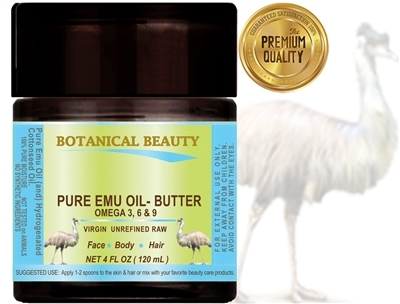 PURE EMU OIL BUTTER 100 % Natural 2 Fl. oz. - 60 ml. ULTRA CLEAR PURE EMU OIL 100% Pure 0.5 Fl. oz. - 15 ml. ORGANIC EMU OIL HYDRATION FACE CREAM 2 Fl. oz. - 60 ml. PURE EMU OIL BUTTER 100 % Natural 4 Fl. oz. - 120 ml. ORGANIC EMU OIL HYDRATION FACE CREAM 4 Fl. oz. - 120 ml. PURE EMU OIL BUTTER 100 % Natural 8 Fl. oz. - 240 ml. ULTRA CLEAR PURE EMU OIL 100% Pure 1 Fl. oz. - 30 ml. ULTRA CLEAR PURE EMU OIL 100% Pure 2 Fl. oz. - 60 ml.